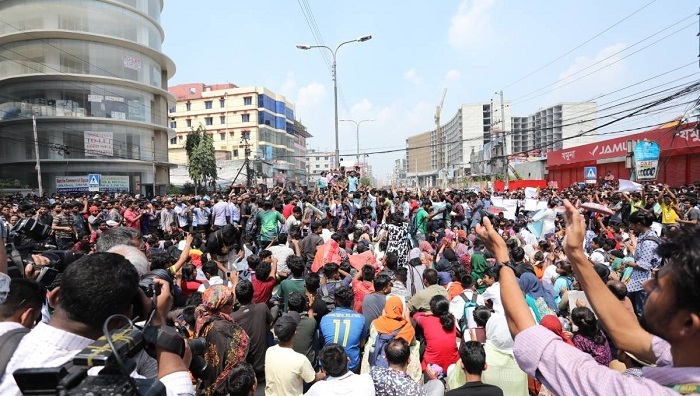 A section of the agitating students mainly of Bangladesh University of Professional, suspended their road safety movement for seven days but many others on Wednesday vowed to continue their demonstrations in the city until their demands are met. Kawsar Habib, a student of North South University who has been leading the movement, on Wednesday announced that they have decided to stop the protest at 7pm for the day and will start staging demonstrations around 10 am Thursday, reports UNB. “We won’t stop the movement though a section has announced to suspend the agitation for seven days,” he said. Several hundred students of the North South University, American International University, Independent University, Southeast University, United International University, several colleges and schools have been staging demonstration in different parts of the city, including Pragati Sarani, demanding safe roads following the death of a student in a road crash. Abrar Ahmed Chowdhury, a student of Bangladesh University of Professional, died in front of Bashundhara residential area on Tuesday morning after being hit by a bus of Suprobhat Paribahan. Since then, the students have been staging demonstrations at Pragati Sarani demanding capital punishment of the driver responsible for the death of the student, closure of Jabal-e-Noor and Suprovat bus services, and installing footbridges near all educational institutions. Their demands include maximum punishment for the bus driver, checking papers of drivers on a regular basis, making transport sector free from political influence, installing speed-breakers at risky points and stopping unfit vehicles from plying. Earlier in the day (Wednesday), a group of students from Bangladesh University of Professionals announced to suspend their ongoing agitation for seven days till March 27 after getting assurance of necessary steps from Dhaka North City Corporation Mayor Atiqul Islam. Faisal Enayet, the spokesman of a 10-member delegation that met the mayor, said they decided to suspend their movement after the mayor assured them of taking necessary steps within a week. Just after the meeting, the DNCC Mayor said the authorities will identify the areas where there is no zebra crossing and footbridge. “We’ll first work out a special plan within the next seven days in this regard and initiate steps with the next 30 days to implement it,” said Atiqul Islam. Dhaka Metropolitan Police (DMP) Commissioner Asaduzzaman Mia, Vice Chancellor of Bangladesh University of Professionals (BUP) Major General Md Emdad-Ul-Bari, some others officials concerned were, among others, present at the meeting.